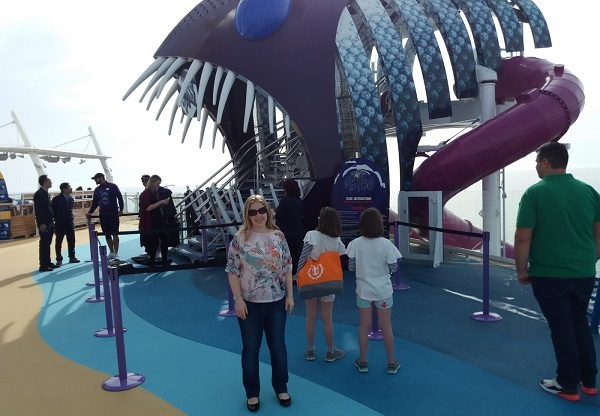 Donna Hardwick, Senior Travel Consultant at our Thorpe Travel store in Norwich, was lucky enough to be one of the first people to sail on board the brand new Symphony of the Seas. Here is what she made of the world’s largest cruise ship. This was the first time that I had travelled with only hand luggage. The panic set in about a week before the trip when I realised that I would not only be on a rather restricted weight limit but also that I would need to be savvy when it came to packing toiletries etc. to get through security. Thankfully, the packing was a success and, on the day, we made it through to departures at Stansted in record time. Ryanair has recently changed its booking benefits and wants customers to pay another supplement (on top of everything else) to upgrade to ‘Priority’. The Priority passengers stood in a separate queue and boarded the aircraft first. They were also allowed to take cabin bags in the aircraft whereby our bags were tagged at the gate and taken down to the hold. To be honest, our waiting time was pretty minimal on top of theirs and the baggage thing really wasn’t an issue so I was more than happy for my ticket to read ‘Non Priority’. Flying out, the flight was on time and uneventful (other than the fact that I spotted ‘Phil’ from EastEnders sat two rows ahead of us!). On the way home, we were delayed by one and a half hours at Barcelona Airport due to a French airstrike. Symphony of the Seas is now the largest passenger ship afloat, boasting a maximum capacity of 6,680. It towers high at 18 decks but, at first glance, it was the width of the ship that stood out to me. Royal Caribbean has mirrored a lot of the dining, drinking and entertainment venues from their other ships but, being the newest and the biggest, there were some unique additions added. Although it was big, I found it easy to get around and find my way to where I wanted to be. There were lots of interactive maps and plenty of signs everywhere. However, I had mixed views on our cabin. We were allocated a ‘Promenade View Balcony Cabin’; it was a decent size, bright and clean, and the bed was nice and comfy. The issue I had was with the view from our balcony. As I said before, the ship was much wider than any other I have seen. The width is for a good reason, as the design allows passengers to have a choice between an original ocean view balcony cabin and an interior view balcony cabin. 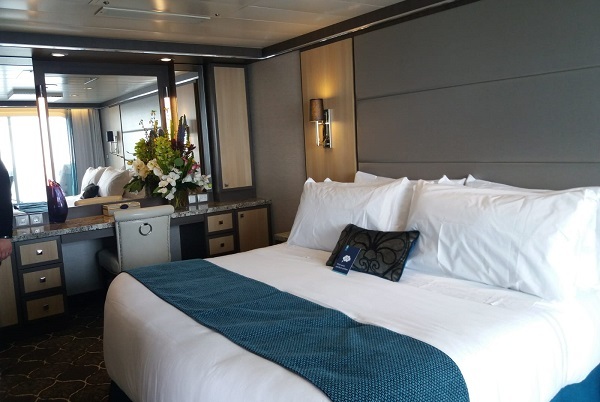 (There are plenty of other room types too – suites, interior cabins, ocean view cabins and those with virtual balconies) . The interior view balconies either overlook the Promenade (like ours) or the Central Park area. So, for us, we walked out onto the balcony and we could see the carousel, the ice cream parlour, sweet shop, Johnny Rockets and the Playmakers Sports Bar. By leaning over the balcony, we could also see the entertainment area where Aqua Nation perform their diving and water-based show. It was noisy on The Promenade, with lots of music and atmosphere but the balcony door must have been heavily soundproofed as we couldn’t hear a sound in our cabin when the door was shut. The reason I was undecided about this cabin is that our balcony was very much in public view. There was a wall of balconies around us and a wall of balconies opposite, so when we did sit out you could see plenty of other people also sitting out and even into the cabins opposite as they were so close. Luckily for us, it was a fully inclusive trip. Under normal circumstances, the food would be included but drinks would be chargeable or a drinks package would need to be purchased. All of the entertainment is included and the use of the ship’s facilities. For families, the kids’ clubs are also included in the price. Some of the dining venues are deemed ‘Speciality’ and carry a surcharge for paying passengers. They are all themed and mostly offer specific food types i.e. Italian, fish restaurant, steak house, sushi bar etc. The dining options without the surcharge are spread out and well varied, so you could still experience a variety of food choices and experiences without paying a penny more. It is also possible to obtain soft drinks and hot drinks at no extra charge if you were to use the self- service machines which are positioned at any of the self-serving dining venues. Speciality hot drinks are served from Starbucks on deck 5 but customers would have to pay from these. Each day, a programme of events is left in your cabin with details on forthcoming shows, performances, lectures and workshops. All of these activities are included in your cruise price and include various different entertainment options. We were lucky enough to see the West End show Hairspray, which is being performed in the main theatre on all forthcoming cruises. The standard of the show was extremely high. There are also plenty of chances to listen to live music. The resident band were very good (we were blown away by their rendition of the Bohemian Rhapsody) and if jazz or karaoke are preferred there are venues specialising in these also. On the second night, we saw some stand-up comedy. There were also options to see an ice-skating show and the Aqua Nations water show which was truly spectacular. On top of all of this, passengers can enjoy free access to the facilities on the ship which include things like crazy golf, table tennis, a sports court (for basketball and football), rock climbing, zip wire, carousal, water slides and the Flow Rider. 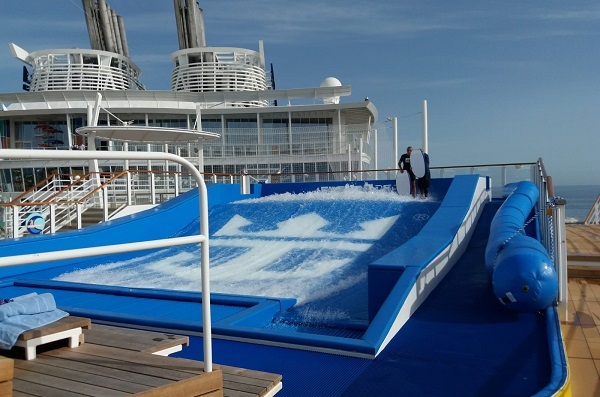 The Flow Rider is a surfing simulator up on deck where brave volunteers attempt to ride waves and is a regular feature on Royal Caribbean ships. A fairly new addition to the Royal Caribbean ‘wow’ features is a dry slide (where you sit in a sack) and travel down 10 decks. Going by the name Ultimate Abyss, it is currently the tallest slide at sea. Yes, I gave it go and, actually, in my opinion, it was pretty slow. It was an easy way to get from the top to the bottom of the ship though. A new feature which is exclusive to Symphony of the Seas is laser tag. This is set up in one of the entertainment venues, not as a permanent fixture but as advertised on the daily schedule. Unfortunately, I didn’t get a chance to take a peek at this. There are a few stand-out moments from this trip. The Aqua Nation show was seriously impressive. The high dives were dizzying and there was a moment when two men walked on a tightrope high above the venue. There was also a juggling act with a twist which was really cool. I also enjoyed the Hairspray show in the theatre. The quality of performance was great; they had some really talented singers and dancers. There was a moment on the first day when I sat in the sun on a quiet bench in the Central Park area with a glass of prosecco and thought ‘this is the life.’ The design of Central Park is clever as there are twists and turns in the pathways which create little spots for seating that are a little bit more private and relaxing than being up on the open deck. Although, saying that, there is also a lovely area on Deck 15 called the Solarium where it is easy to find a quiet spot and dream the day away. The Solarium is an adult-only area positioned at the front of the ship, open at the top but with floor-to-ceiling glass protection which invites the wonderful views in but at the same time protects you from the elements. There are plenty of relaxed seating areas, sun loungers and a few Jacuzzis thrown in. With the bar and a café area just steps away this is the perfect area to spend sea days. The main plus point to this cruise and the experience we had is that I didn’t get bored! I love to keep busy and struggle to sit still for too long and this place is perfect for someone like me as there is plenty to do – lots of options and variety. Generally, I think everything went well on this cruise. The staff were attentive, the food was decent and we didn’t have to wait long at any of the food or drink venues. We had a couple of issues with the toilet in our cabin whereby it wouldn’t flush. Upon reporting it, it was fixed within an hour or so - but it was an inconvenience. Hopefully, this was just an early voyage blip. One evening, I was also appalled by the cleanliness of one of the public toilets (there seems to be a theme here). As, now thinking about it, I also had an issue with the fact that there were only a few public toilets near the main restaurant and only a few near the main bar areas. For ladies, especially, this resulted in long queues. My only other annoyance over the three days is that I only found one decaf teabag on board. Unfortunately, I cannot drink caffeine, so I rely on decaf versions of hot drinks. It was OK as they had decaf coffee but I missed having a cup of tea. I guess, being an American ship, they would not necessarily consider their tea options as much - it’s probably just a British thing. I would recommend this trip to our customers. I think those travelling as a family with children would benefit from the large range of activities and the great kids’ clubs - with their extensive range of facilities. Older travellers may find this ship a little too family focused. It certainly wouldn’t be for those who appreciate a quiet, less sociable experience on their holiday. I haven’t really mentioned the food on board but it was of a really good standard, as was the service from the staff. I would have liked to have tried the Mexican on deck 17 as that looked lovely; it was outdoors, relaxed and the food looked great. I also haven’t mentioned that there is an extensive spa on board and a well-equipped gym. We walked past this on the first time around with thoughts of going back but then forgot to do so. The Casino is also enormous, rivalling some that I saw in Las Vegas. It would have been good to know how many of us were actually sailing on our particular trip to know how realistic our experience really was when it came to the amount of personal space we had on board. There was just one moment in the karaoke bar when people were spilling out and squashing together and I felt it was too much. But other than that there was plenty of room, plenty of seats, plenty of options and plenty of areas to accommodate all. Must do? Everything you want to. I ran out of time to give the rock climbing wall a go which I wanted to do! Also the laser tag. There are so many options; it takes a bit of planning to fit it all in. Must try? 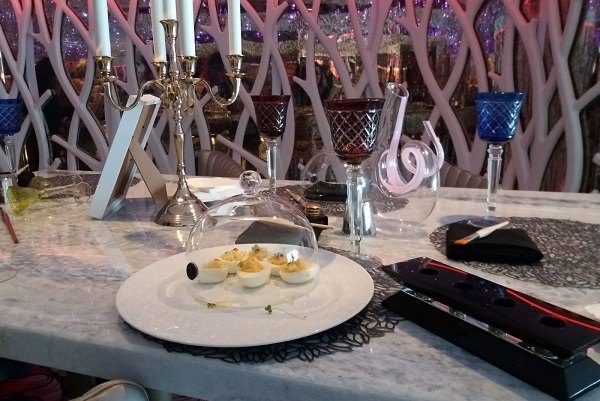 The food and décor in the Wonderland restaurant are truly unique. Your taste expectation is fooled by clever design and the imaginative presentation of their dishes. If you would like to plan your own cruise holiday, on board Symphony of the Seas or any other ship, drop by your local Fred. Olsen Travel Agents. We have stores throughout East Anglia and along the South Coast.